Police are searching a rural property after a person was arrested on Friday. 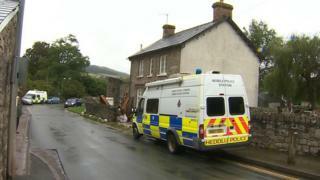 Officers wearing white overalls were seen under a gazebo at the rear of a house in Crickhowell, Powys, on Saturday. Dyfed Powys Police said there was no reason for residents to be alarmed and confirmed officers would continue searching the property on Sunday. "Officers are not looking for anyone in connection with the allegation," a police spokesperson said.